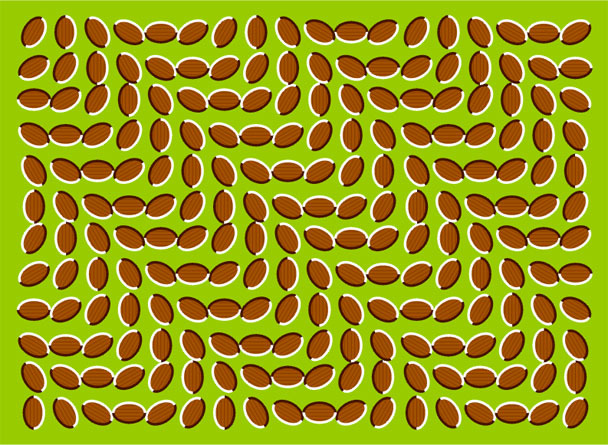 The acorns (or donguri in Japanese rōmaji) in the figure above appear to move in waves even though they do not move at all. The figure was created by Akiyoshi Kitaoka. A. Kitaoka, "Waves", May 6, 2004. [Online]. Available: http://www.ritsumei.ac.jp/~akitaoka/wave-e.html. [Accessed: Mar 30, 2010]. A. Kitaoka and H. Ashida, "Phenomenal characteristics of the peripheral drift illusion," in Vision, vol. 15, pp. 261–262, 2003. A. Kitaoka, "Waving illusion produced by the peripheral drift illusion," presented at the Demo Night in Vision Sciences Society 5th Annual Meeting (VSS2005), Sarasota, Florida, USA, 2005.